No one wants to do laundry on vacation, but when you are away with your entire family, nothing else is more convenient. Our large washer and dryer will allow you to pack a little less and will be there whenever you need it. The laundry room is located next to the kitchen on the second floor of the house. 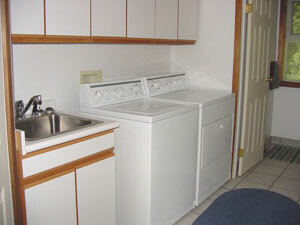 As seen in this picture, there is also a sink for hand washing next to the washer and dryer. We keep a small supply of laundry soap on hand for guests. © 2011 Saturna Seaside. All Rights Reserved.